The Rift Walker is the second book in a trilogy of high adventure and alternative history. 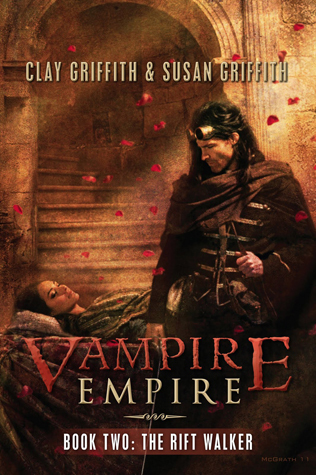 Combining rousing pulp action with steampunk style, the Vampire Empire series brings epic political themes to life within a story of heartbreaking romance, sacrifice, and heroism. I’m not sure if words can adequately express how excited I am for this book. The Greyfriar, which was the first book in the Vampire Empire series, is hands down, one of my most favorite books of 2011 (review coming soon), and if you haven’t heard of this series, you need to rush to Amazon or Goodreads and check this book out immediately. Like seriously. Now. Be gone with you. What reads are you looking forward to? Remember to enter the July New Release Giveaway! Thanks for the visit! Love your blog. This looks like a delicious series and something I really must put on my “must read” list!! Thanks for checking out my WOW this week! Vengeful husband? hmmm… haven’t heard of this book, thanks for sharing I’ll look up the first one also. Oh, wow! I hadn’t seen this one till now but 1. that cover is so captivating and 2. love the synopsis! Love the way its fantasy has a historical aspect to it – like they said, the ‘steampunk style.’ I really like that last paragraph too and all that it promises. I will have to check out The Greyfriar too :). Thanks so much for sharing this! Will go add it now to my to-read pile!! I’ve never heard of this, but it looks interesting. Thanks for stopping by my WoW!